Isola and Yusuf studied mass media coverage and reporting of human rights abuses in the internally displaced peoples’ (IDP) camps in Nigeria using primary and secondary resources. 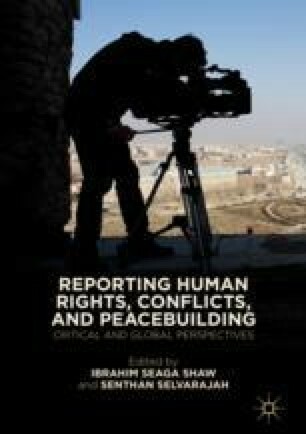 They observe that human rights issues pervasive in IDP camps are poorly reported due to several constraints facing the media. The Nigerian security forces perpetrate many of the rights abuses and did not make coverage and reporting of the abusive incidents easier because of their repressive tactics towards the media. The media’s quest to survive economically also contributes to ignoring and sometimes hiding information about abuses in IDP camps. Journalists need to deepen their understanding of the humanitarian legal instruments that protect IDP camp residents, while Nigerian government and international organizations must make relevant information and data on IDPs accessible to the media. Ehikioya, A. (2016). President Buhari Orders Probe of Human Rights Abuses in IDP Camps. The Nation. Retrieved April 20, 2017, from http://thenationonlineng.net/buhari-orders-probe-human-rights-abuses-idp-camps/. Erunke, J. (2017). Accidental Bombing of IDPs Camp: Nigerian Airforce Apologize. Vanguard. Retrieved April 20, 2017, from http://www.vanguardngr.com/2017/01/accidental-bombing-of-idps-campnigerian-airforce-apologizes-over-action/. Human Rights Watch World Report. (2016). Retrieved from https://www.hrw.org/world-report/2016/country-chapters/Nigeria. Kingsley, P. (2016). The Small African Region with More Refugees than All of Europe. The Guardian Newspaper. Retrieved April 20, 2017, from https://www.theguardian.com/world/2016/nov/26/boko-haram-nigeria-famine-hunger-displacement-refugees-climate-change-lake-chad. News24.com (2016). Internally Displaced Persons in Nigeria. Retrieved February 23, 2016, from www.news24.com.ng/National/News/laws-to-protect-rights-of-idps-will-soon-beenacted-dogara-20160223. Obaji, S., & Abolo, E. (2016). Internal Displacement in Nigeria and the Case for Human Rights Protection of Displaced Persons. Journal of Law, Policy and Globalization. Retrieved from www.iiste.org. ISSN 2224-3240 (Paper), ISSN 2224-3259 (Online), Vol. 51. Punch. (2016). Retrieved February 15, 2016, from www.punchng.com. Rotimi, O. (2016). IDPS in Nigeria: From Insecurity to Insecurity. The Cable News. Retrieved April 19, 2017, from https://www.thecable.ng/idps-nigeria-insecurity-insecurity. UNCHR (2016). Protecting Internally Displaced Persons: A Manual for Law and Policymakers. (2016). Retrieved February 24, 2016, from http://www.unhcr.org/50f955599.pdf.